In this issue we publish brief profiles of sixty eight individuals with Lenton connections who lost their lives in the course of the Second World War - with a further sixty to come in the next issue. Most readers will know that Lenton erected a memorial to those who died in the First World War which stands in front of the Albert Ball Memorial Homes at the junction of Church Street and Sherwin Road. Many may suppose that the memorial was subsequently updated to include some mention of those who died in the Second World War. The fact is this never happened. The Society, wanting to remedy this oversight, some years ago constructed provisional lists of names which were deposited in the churches of Holy Trinity and St. Anthony's. Other people have since come to light. Including the names in the magazine allows us to publicise the project and make yet another attempt to seek out any additional names. There is still some information missing from our existing profiles and we have little in the way of visual reminders of who these particular individuals were. The war-time newspapers published photographs of many of them but we can only access these on microfilm at the Central Library in Nottingham. Any copies we might try to take from the microfilm versions are of such poor quality that we have decided against using them. However if surviving relatives have any original photographs we should be happy to make copies and include them in the next or subsequent issues of the magazine. If they have any additional information they would like to share with us, the Society would be delighted to receive it. Whether we can arrange for a permanent memorial to be erected remains to be seen but at least we are doing our bit to ensure 'They will be remembered'. The Wesleys in question are George and Barbara Wesley and their two daughters, Carol and Wendy. No.20 Churchill Street was their family home from the early 1940s until the Nottingham Corporation acquired the building along with all the neighbouring properties in the early 1960s as part of a clearance programme. 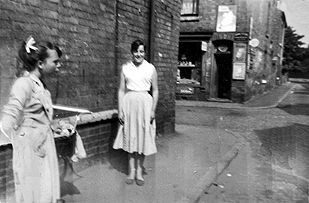 Carol Williams (née Wesley) recalls what life was like growing up in this particular part of Old Lenton. Bernard Heathcote has searched through thirty years worth of Nottingham newspapers looking for reports of inquests carried out by Christopher Swann, a Nottinghamshire coroner. He found some four thousand five hundred. At this time public houses were the customary venue for holding inquests and this remained the case until an Act of 1902 encouraged the provision of special premises. Inquests were required in cases of violent, unnatural or unexplained sudden death, and would be held in the locality where 'the body lay dead'. Bernard Heathcote provides the reader with accounts of just over a hundred of these inquests grouped according to the cause of death. So we begin with an accidental overdose of opiates followed by various other types of accident including 'struck by lightning' and 'death in a balloon'. Then come suicide, murder, manslaughter and more unusual verdicts such as death from eating ox-tail soup and death from fear and excitement. When he gets to the murder and manslaughter verdicts, the examples are written up in greater detail. Our own write-up of the book highlights the various Lenton inquests the author came across. It concludes with the hope that the author will eventually deposit all his basic research information with the Local Studies Library so that subsequent researchers can also benefit from all his labours. Some years ago several members of the Society were involved in a project somewhat similar in nature to that of Bernard Heathcote. They looked at copies of old newspapers held on microfilm and made notes of any news items with a Lenton connection. Only a few years from the early/mid nineteenth century were completed but this still represented many hours of devoted labour. All manner of intriguing aspects of Lenton's past came to light as a result and the details are now lodged in the Society's archives. Drawing on this work we provide readers with our own selection of Lenton inquest reports taken from the newspapers of the late 1830s. Given the theme of the two previous pieces it seemed appropriate to turn the historical spotlight on a former resident of Old Lenton, Michael Browne, who was the coroner for the Borough of Nottingham for over fifty years and, at the time of his death in 1891, was believed to be the oldest coroner in England. We failed to locate any photographs of Michael Browne but the house where he lived for almost forty five years, No.16 Gregory Street, does feature on an old picture postcard taken in the early twentieth century and so this illustration makes its way into the pages of this issue. David Smith was looking through some old photographs in his possession when he came across one showing the Leengate bridge under construction. This is the bridge which allows vehicles to get on to the Queen's Medical Centre complex from Gregory Street. It replaced an earlier wooden bridge that straddled the Nottingham Canal and gave pedestrians access to the Spring Close area from Leengate. 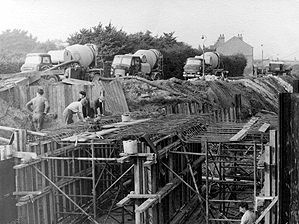 We explore the background to the construction of the road bridge which took place in the 1960s and also feature both a present day view of the same structure and its wooden predecessor. Stephen While, based in Lenton, is Nottingham's only Curative Hypnotherapy practitioner. This feature describes how he treats people and describes the range of problems he is able to address. Lenton's First World War memorial lists the names of two hundred and eighty eight local men, plus one woman, who died in the Great War. While some localities chose to update their memorials to include at least some mention of the 'ultimate sacrifice' made by those who died as a result of the Second World War - this did not happen in Lenton. No attempt was even made to compile an official list of names. Lenton Local History Society has been involved in a longstanding project which seeks to remedy these deficiencies. This particular article details the various sources used to identify those with Lenton connections who died in the Second World War and how we set about discovering more about them. For each of the people featured we provide their full names; service details; the date when they died; their age at the time of death; and where possible, something about the circumstances leading to their death. If they were married we give the relevant details and what subsequently happened to their widows. For most of these individuals we have also identified their parents and where they were living. At the time of the Second World War the parish of Lenton also included Lenton Abbey and Wollaton Park. Given this, any fatalities with connections to these two areas of Nottingham have also been included in our lists. 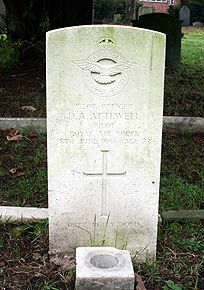 Arnold, Nathaniel, Warrant Officer (Pilot) (745549) RAFVR. 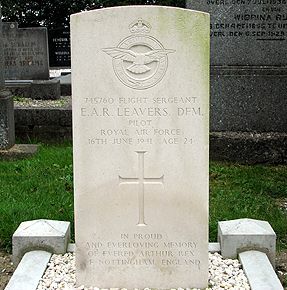 Died 17th February 1942 in a flying accident at Chetwynd Heath near Telford in Shropshire. He was engaged as an instructor at the No.5 Service Flying Training School and was out with a pupil in his plane, Master III W8757, at the time of the accident. Interred Wilford Hill. Age 25. Lived at 6 Park St., New Lenton. [e.1939]. Son of Louis Edgar Arnold (d.1934) & Mary Arnold, of 6 Park St. [e.1939 & 45]; husband of Nora Arnold (née Tunnicliffe) [l.m.1939], of 3 Church St. [n.e.p.20.2.1942 & e.1945]. His widow married Jack Shaw [Nottingham.m.1942]. Before the war he had been a member of the Volunteer Reserve at Tollerton. Nathaniel Arnold was the brother-in-law of Wilfred Tunnicliffe. Ernest William Alexander; Frederick Laurence Anderson; Ernest Osborne Armes; John Edwin Armitage; Douglas Arthur Attewell; Brian Herbert Austin; Donovan John Bacon; Charles Arthur Beardall; Denis John Bell; George Arthur Bentley; Noel Bexon; Albert Eric Bland; Frederick Blasdale; Charles Leonard Booth; John Montague Charles Bougin; Derek Arthur Bradbury; Albert Harold Bragg; Percy William Burr; Harold Edwin Burton; Denis George Button; Kenneth Ewan James Edgar Carpenter; Herbert Mitchell Clarke; Kenneth Ezekiel Clarke; Raymond Clarke; Arthur Leonard Cleaver; Percy John Cooper; Jack Cope; Frederick William Cotton; Walter Daft; Arthur Stuart Dalgress; Hector Duro; John Edward Elston; Clifford Richard Fardon; Arthur Fox; Arthur Leonard France; Victor David Gee; William Congreve Ghest; John Cheslyn Gibbs; Leonard William Jack Goodfellow; Bernard Green; William Arthur Griffiths; Ronald Hall; Thomas Albert Hall; Arthur James Hands; Kenneth Charles Hardy; Kenneth William Harris; Raymond Harrison; Reginald Jabez Heath; Kenneth Henson; Clarence [Cal] Hill; Geoffrey Hodgett; Frank Holbrook; William Leonard Hole; Willis Charles Holt; Reginald Arthur Hooton; James Hopkins; Peter Gordon Francis Howitt; John Stephen Hudson; Frank Jarvis; Clarence Arthur Jessop; Frederick Arthur Job; Harry Ellse Johnson; Richard Coulson Johnson; Arthur Kirchin; Evered Arthur Reginald Rex Leavers; John Henry Lucas. The details of the World War Two Fatalities M - Z will be published in the next issue of the magazine. A casual conversation with a stranger back in 1998 enabled Maureen Labbett to re-establish links with Glenys Randle, someone she had last seen in the mid 1940s when she was evacuated to Lenton. Maureen provides us with her memories of the brief period of time spent here after the Germans bombing of London with V2 bombs prompted her parents to send her to live away from the capital. Richard Gadsby's childhood home was 66 Highfield Road. His parents, Tom and Edith Gadsby, always stressed their house was in Old Lenton rather than Dunkirk. That said it was to Dunkirk Primary School that Richard was taken so that he could be enrolled in early 1942 and he provides readers with his memories of attending school there during the Second World War.